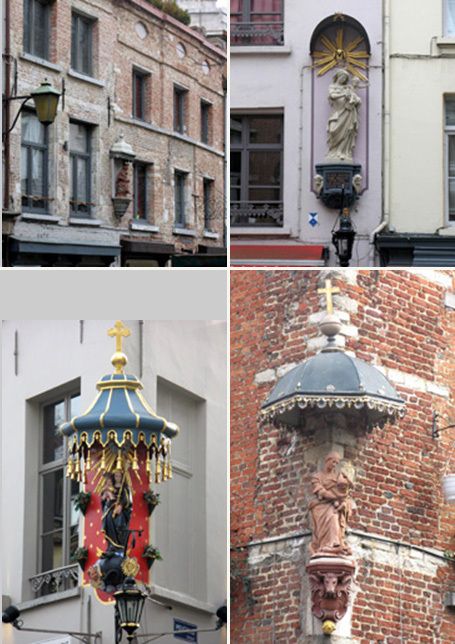 Four ’street Madonnas’ from the city centre of Antwerp: from left: 1) The 18th century Virgin and Child on the corner of Prinsestraat and Pieter van Hobokenstraat, 2) An 18th Virgin and Child, sitting on the globe, on old brickfacades in Lijnwaadmarkt, near the cathedral, 3) A newly painted 19th century apocalyptic Virgin with Child on the corner of Oude Koornmarkt and Pelgrimsstraat, and 4) a late 18th century Virgin and Child further down the Lijnwaadmarkt towards the Melkmarkt. On the postament an inscription reads: ‘Gy syt schoon ende sierlyck [letter wissel] o sy scynt hiergelyck de son’. In English: You are beautiful and elegant [letter wissel] O she shines here like the sun. All photos were taken in February 2009. A Jesuit priest, Johannes David, wrote a handbook about how to behave properly as a devout Catholic Christian. The title of the book may be translated into something like ‘The Flower-Garden of Ecclesial Ceremonies, as well as a Christian housekeeper to clean out bad habits’. In Dutch: Bloem-hof der kerckelicker ceremonien item den christelicken hyus-hovder met eene spongie der qvader seden. The book was published in Antwerpen in 1607 by the publisher Joachim Trognaesius. Generally, all images of saints were supposed to make an impression on the beholders. Apart from the mere decorative function, these images, David wrote, had three main purposes: To make us remember things in the past (which meant things belonging to the history of salvation), to instruct us (in what happened and what the Church teaches), and to awaken our desire to imitate the saint in our lives. But more specifically, Fr David asked what it meant that there were statues of Mary on the houses? And he answers himself: ‘This shows us that the pure Virgin and Mother of God, Maria, is a special protector of Christians in all danger and distress (…) The houses, those who live in them, and their neighbourhoods, are better protected by Mary the more they honour her in this way’. In Dutch: Dat beteeckent ons / dat de suyuere maeght ende moeder Godts Maria eene sonderlinghe patroonesse der Christenen is /in allen noodt ende perÿckel. … Die huysen / huysghesinnen / ende ghebuerten zijn in de bewaernisse van Maria te beter bevolen / midts de eere die sy haer in die maniere bewÿsen. (p. 113) In an age with little protection apart from the protective power and intercessions of the saints, any house owner would probably do his best to honour them in this way. Thereby the images protected the neighbourhood as well, since fire or contagious deceases were always a threat. So, the sculptures had the obvious task to protect the house and those living in it. To anybody passing by, moreover, they kept the history of salvation in mind and should kindle a devout greeting and a pious desire to configure their lives to that of the Virgin Mary. Hence is was only natural that another Jesuit author of an edificatory book, a B. le Maître in Pratiques de Pieté, ou les veritables Devotions, approbated in 1677, should exhort his readers to honour the Virgin Mary by entering her confraternities, wear the scapular with devotion, pray the rosary, ‘and always have an image of the Virgin in your house to greet with devotion and veneration – like you should do before those images you meet on your way’. In French: “Ayez chez vous l’Image de la sainte Vierge, honorez-la respectueusement, comme aussi celles que vous rencontrerez dans vôtre chemin”, (quoted from a copy published in Lille 1714, p. 169). And the images of Our Lady ‘met on my way’ would quite often be precisely the sculptures placed on the houses. Any road crucifix, and church tower above the roofs, any procession in the streets, any sculptured saint or Mother of God on the street corner or on the front of buildings, indeed, any beggar holding out his or her hand for alms would remind the faithful of the fact that the visible, tangible world was only a thin veil over the Divine reality of religion, and these phenomena were simply holes in that veil, places where these two worlds were joined. Hence, the Madonnas may be seen as protective measures, at the same time, though, as reminders, provokers of devotion and consciousness.